WWE NXT UK brand held TV tapings on Sunday in Blackpool, England. 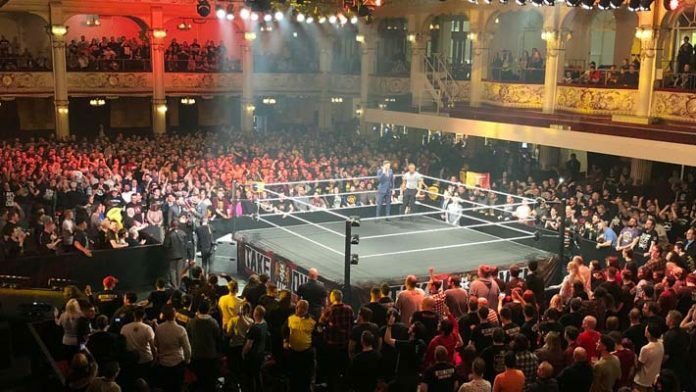 The journey of bringing the WWE NXT UK brand to the more fans has continued as the company held TV tapings on Sunday from the Empress Ballroom in Blackpool, England. As of this writing, there’s no word yet on when these shows will air but WWE likely start to air these episodes on their streaming service, WWE Network, shortly. – Pete Dunne walked out to the ring to cut a promo but was interrupted quickly by Gallus and Joe Coffey, who stated that he lost the battle but would win the war. WALTER came out to the ring. This led to Gallus starting a brawl but Wolfgang ran down to even the odds and the faces stood tall in the ring. – Nina Samuels beat Lana Austin with her GTS to the back of the head. – Jordan Devlin vs. Travis Banks went to a double count-out once Banks and Devlin tumbled out of the ring and couldn’t get back before the ten count. Post-match, they both brawled. – James Drake and Zack Gibson did a promo in the ring about winning the NXT UK Tag Team Titles. They confirmed their tag team name as the Grizzled Young Veterans. This led to Sid Scala coming out and announced that they would be defending the titles against Danny Burch and Oney Lorcan at the NXT UK tapings at Royal Rumble Axxess in Phoenix. – Ligero beat Mark Andrews with the C4L Springboard DDT. – Xia Brookside beat Candy Floss. Post-match, Rhea Ripley ran in and attacked both women. Toni Storm made the save, but after she headbutted Ripley then hit Storm with Riptide.